It's easy to get around Downtown DSM by car, bike, bus or on foot. Whatever your preferred way to get from one place to another, we've got you covered! Visiting Downtown DSM soon? Download a map to make the most of your experience! One of the great parts about living in Downtown DSM is parking. Unlike other cities in the Midwest, parking options in Downtown DSM are readily available and reasonably priced. There are approximately 30,000 public parking spaces in Downtown DSM, including more than 3,500 parking meters for long- and short-term parking needs. So whether you’re commuting to Downtown DSM for work or are in town for a day trip, it is easy to park near your destination. Downtown DSM is growing faster than ever. At last count, more than 40 development projects were underway or recently completed. With such a vibrant Downtown, you might think that parking would be a pain. Fortunately, that’s not the case. Historic Court District: Park in the Third Street and Court Avenue ramp, Science Center of Iowa & Blank IMAX Dome Theater ramp. Tip: During evenings and weekends, free parking is available in Polk County lots in the Historic Court District. Des Moines Civic Center: Park your car next door at the Fourth Street and Grand Avenue parking ramp or the Third Street and Court Avenue parking ramp. Valet parking available curbside during Civic Center shows. Wells Fargo Arena: Park in the Fifth Avenue and Keo Way ramp, Fourth Street and Grand Avenue parking ramp or the Center Street Park and Ride ramp on Seventh Street. Western Gateway Park: Park at Davis Brown Tower on 10th Street and Mulberry Street ramp, the Ninth Street and Locust Street ramp or the Nationwide Insurance ramp at 13th Street and Mulberry Street. Historic East Village: Park at East Second Street and East Grand Avenue ramp. There is also a free ramp at East Grand Avenue and Pennsylvania Avenue. Standard rate for all City of Des Moines parking garages is $1 per hour. Throughout 2018, Des Moines is updating their parking meters to charge Monday through Saturday from 9 a.m. – 9 p.m. Look for a sticker on the meter that shows the new meter times to know what hours you need to pay the meter. Meter rates range from $0.25 to $1.75 per hour. Tip: Follow signage for free parking in Polk County lots during evening and weekends. One great way to use metered street parking is with SmartCards. A person can insert the SmartCard into a parking meter and buy time on the meter. If there is time left on the meter when the person returns, they can reinsert the same SmartCard and have the remaining value on the meter refunded back to their SmartCard. There is a yellow SmartCard label on the front of all parking meters that accept the SmartCard. The yellow SmartCard label is clearly visible from the street so you can easily know which meters accept the SmartCard before deciding where to park. Located conveniently throughout Downtown DSM, these special meters allow for a short duration of free parking. Instead of inserting coins into the meter, there is a button you push which gives you 15 minutes of parking. There is, however, a 30-minute limit on parking at these meters. Parker Premium Services is an automotive service that can be provided while you are at work in Downtown DSM to help you save time. Don't worry if you do not already park in these facilities, you are welcome to use this service anyway. There is no daily parking charge for the day that you use this service. Park in a reserved for Premium Services space near the cashier exit booths. Locate the Premium Services kiosk in the lobby of the parking garage. Select and complete a vendor form and envelope. Place the vendor form and your keys in the Premium Services envelope. Remove the claim check from the premium services envelope and retain. Retain the claim check from the envelope. Deposit the envelope into the locked key box located within the Premium Services kiosk. Drop off time is 10 a.m. and pick up time is 4 p.m.
To claim your keys, present your claim check and a photo ID to the cashier. The following is a list of Downtown DSM vendors. Think of all the time you can save by having your car serviced while you are at work! If you’re heading to Downtown DSM for work or play, consider using Uberor Lyft. Enjoy the convenience of finding a ride in one touch while finding the best fares in town. DSM has plentiful trails and Downtown DSM is no exception. Run, bike or walk through our connected city and enjoy the scenery of Downtown DSM. For more interactive trail information, try the Iowa By Trail app. The Central Iowa Trail Association updates trail conditions daily for Center Trails such as Greenwood/Ashworth Park, located on the western edge of Downtown DSM. There are more than 600 miles of connected walking, biking and running trails in the region, with Downtown DSM as the culminating point for many of these area trails. Additionally, mountain biking and hiking trails are nearby as well. DSM has an active cycling community. If you like to get around on two wheels, there are plentiful options to take advantage of your favorite mode of transportation in Downtown DSM. Check out the links below for more details. Art Route is a painted path uniting 87 pieces of public art with a 6-mile-long trail in Downtown DSM, also connected to 14 crosswalks painted at six intersections Downtown. The path includes circles spaced roughly 20 feet apart. Then, chevrons are used to point toward each of the pieces of art. Art Route visitors can download a mobile app to utilize in conjunction with following the painted pathway. 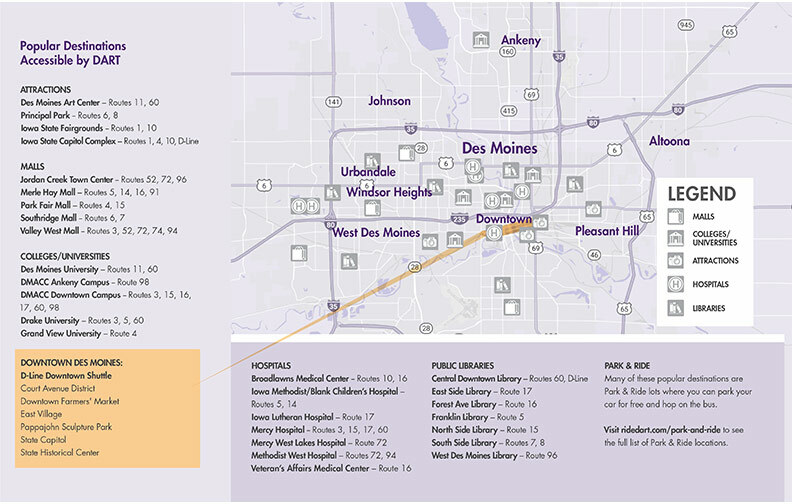 Find a map of the Art Route DSM path and more information on how to download the mobile app. Want a bicycle to ride around Downtown DSM? Choose BCycle, a next-generation bicycle sharing program. BCycle members can pick up a bike at any B-station and return it to the same or different station when they’re finished. A daily Fun Pass is just $6! For more information, visit Des Moines BCycle. Want to really get a feel for Downtown DSM? Try a biking or walking tour! Getting out of the car and into the city is a great way to experience what all the buzz is about. There are tours for all types of interests and groups. The Des Moines Bicycle Collective has a great listing of biking and walking tours. The Downtown Des Moines skywalks provide a convenient and easy way to get around all year round. The skywalk network system is more than four miles of connected climate-controlled skywalks in Downtown DSM. Skywalk DSM will help you navigate through the skywalks of Downtown DSM with only your phone in hand. The app is updated for closures and detours in real time. Download the Skywalk DSM app on Apple or Android devices now. Riding the bus around Downtown DSM is simple with the Des Moines Area Regional Transit Authority (DART). DART offers a free Downtown D-Line Shuttle with buses stopping every 10 minutes at bus stops at Grand Avenue, Locust Avenue and Walnut Street Downtown Monday through Saturday. View DART’s route schedules, bus stop finder, fares and days available. Learn more about navigating Downtown Des Moines' (DSM's) skywalk system with the SkyWalkDSM App.